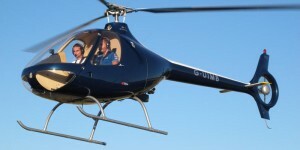 The United Kingdom is already one of the leading countries for fleets of the two-seat composite Guimbal G2 Cabri helicopter, with 14 delivered to date. In the next five months, a further eight G2s will arrive for customers in the UK, and we are confident for 14 deliveries across the twelve months of 2016 to match the number sold in previous years. Further press releases will be issued to cover the arrival of many of these into the UK, including two in the next 4-6 weeks. Helicoptères Guimbal are currently producing helicopters at the rate of around one per week. A new factory building at Aix-en-Provence Airport has been approved by local planners, and construction is expected to start shortly. This will allow the production rate to increase as size of the current facilities is one of the key limiting factors in keeping up with the demand for this helicopter. The G2 Cabri is well supported in the UK, with eight Part 145 maintenance organisations have been approved by the manufacturer. This will form the backbone of further fleet expansion. With most G2 Cabri helicopters in the UK directly involved in flying training work – and subsequent self-fly hire – the demand for instructors is expected to increase in line with the fleet size. Cotswold Helicopter Centre are regularly training new instructors as well as ab-initio pilots. Cotswold Helicopter Centre is based at Cotswold Airport – also known as Kemble – and is well placed for Cheltenham, Gloucester, Bristol, Bath, Swindon and Oxford. We are not only the UK distributor for the French manufacturer Helicoptères Guimbal, but we are also busy with a flying school and charter work. Our fleet consists of seven Guimbal G2 Cabri helicopters, one Robinson R44 and an AS350B2 Squirrel. We offer Cabri helicopters both for sale and on attractive lease terms for UK flying schools.